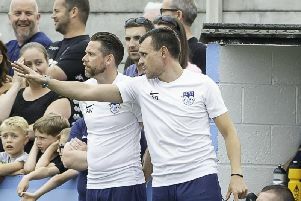 Ossett United manager Andy Welsh (left) with assistant Paul Quinn. Ossett United will be aiming to continue their magnificent run of form when they welcome Carlton Town to Ingfield tomorrow (3pm). Since the turn of the year, United have won all three of their league games, and have rocketed up the Evo-Stik East table and sit just one place outside the play-off positions. Adam Priestley scored Ossett United's only goal as they beat Lincoln United last weekend. Their most recent success saw them win 1-0 at Lincoln United last Saturday thanks to a brilliant headed goal from Adam Priestley. But manager Andy Welsh says that his side must continue to be ruthless if they are to break into the top five. “We are in the mindset now, where last Saturday’s result doesn’t really matter if we don’t pick up points on our home patch tomorrow,” said Welsh. “I am seeing a real ruthlessness and determination in my players at the minute. “The result against Lincoln, we had to fight hard for it. We had to defend well and attack well, with numbers and at the right times. United are yet to concede a goal in 2019, following a 4-0 win over Brighouse Town on New Year’s Day and two 1-0 victories, over Sheffield FC and Lincoln respectively. But Welsh has insisted that keeping the ball out of their own net has not been Ossett’s problem. He continued: “We spoke with the players about the defensive side of things and we said it was never problem. “I think before the turn of the year, we had the fifth-best defensive record in the league. “Our problem has been that we haven’t scored enough goals and that has been the difference in the last three games. “I know in the last two matches we have only scored a goal in each game but in the game before that we scored four and that is the difference. Carlton Town salvaged a late draw against Ossett in mid-November, Riece Bertram netting in the 90th minute after Joe Wilkinson had put Welsh’s side ahead on five minutes. Tomorrow’s opponents currently sit in 16th spot in the league table, 14 points behind United but Welsh insists his players can’t afford to take anyone lightly. He added: “I think anyone at this level is capable, on any given day, to cause an upset. “What we have got to be from now until the end of the season is ruthless in our mindset.